Prasanna Prashad is watching a dance performance inside the New Jersey Exposition and Convention Center, while eating a plate of pav bhaji, a Mumbai street snack. Two couples dancing onstage abruptly come to a stop. Two men wearing thobes, a traditional Arab garment, suddenly burst in carrying laser-beam guns and begin spraying imaginary bullets. A troop of prancing men in SWAT vests emerges, cartwheeling, shooting, and pummeling until the “terrorists” fall. Then, the soldiers and their freed hostages line up, hands on their hearts, and adopt solemn expressions as the Star-Spangled Banner begins to play. Prashad, who grew up in Hyderabad, a south Indian city, is growing anxious. She’s been waiting three hours to see Ram Charan, an actor from Tollywood, a film industry based in the south Indian states of Telangana and Andhra Pradesh. She did not particularly care that the event she was attending, Humanity Against Terror Charity Concert, was actually a Tollywood-Bollywood spectacle to promote Republican presidential nominee Donald Trump. “We came for the entertainment,” she says. Her son, in a brocade Nehru jacket, is curled up in the seat next to hers. “We don’t have evening plans so maybe we will have dinner here.” In one corner of the room, Bollywood Flavors Caterers is preparing a spread of Indian street snacks interspersed with tumblers of mango lassi. 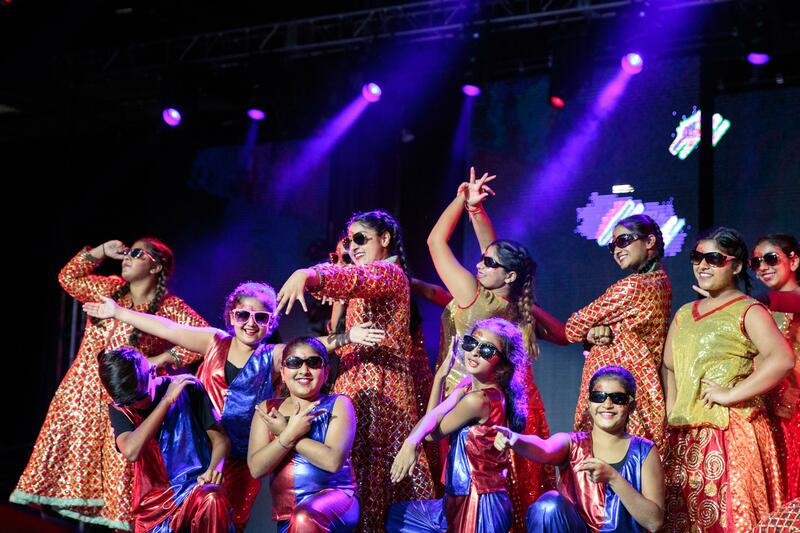 A dance group performs for the celebration. Kumar, an electronics business tycoon from Chicago who goes by the nick name Shalli and likes to wear suits embroidered with his own initials, is one of Trump’s leading financial backers, having contributed $900,000 dollars to the Republican presidential nominee’s campaign. 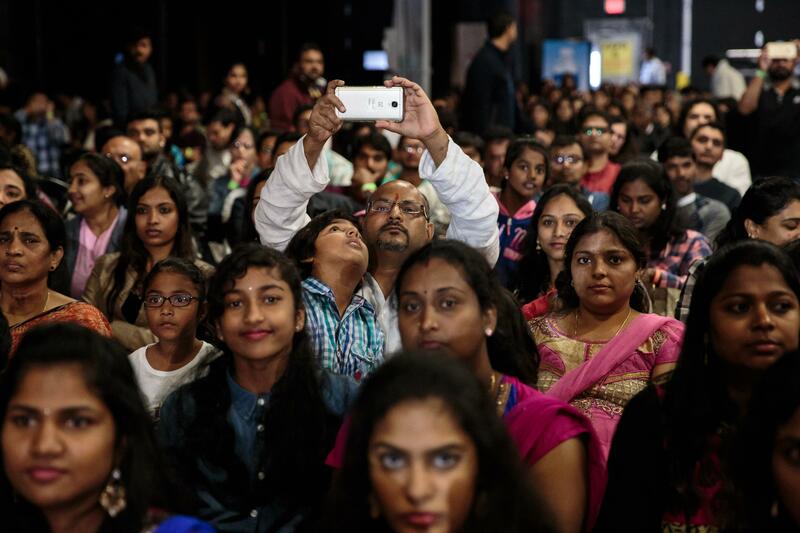 Indian Americans are the second largest and fastest growing immigrant group in the country, but have traditionally not been viewed as an influential voting bloc. 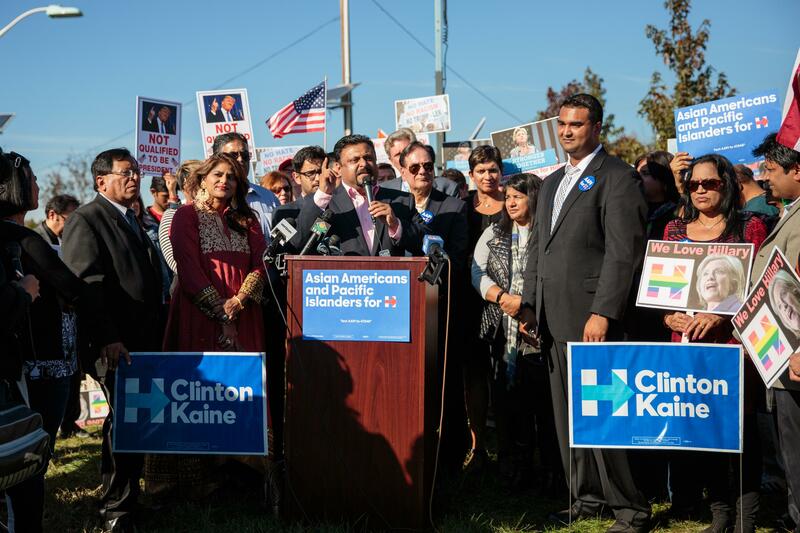 Typically, both Hindu Americans and Indian Americans are seen as reliable Democratic voters. The 2012 National Asian American Survey showed Asian Indians as among the top Asian-American subgroups most likely to identify with the Democratic Party. This year’s survey shows their party lines remain about the same, although alignment with the Republican Party has inched up slightly—from three to seven percent. Indian Americans arrive for the celebration. “I grew up admiring J.F.K. His pictures used to be plastered all over town as the most handsome president of the United States ever,” Kumar says at the event. He says he began to move toward the right after a chance meeting with Ronald Reagan in 1979. “He convinced me that my values were conservative, and I became perhaps the first Republican Indian American in the country,” Kumar says. By the time Trump arrives on stage, the audience has already been treated to Prabhu Deva, the south Indian dancing star who is often called the Subcontinent’s answer to Michael Jackson, and a sermon from the Hindu spiritual leader Sri Sri Ravi Shankar, who talked about how the American constitution aligned with the Hindu belief system. Newt Gingrich, the former Speaker of the House and presidential candidate, detailed his friendship with Shalli in a pre-recorded video address. Gary Weightman, a retired bar owner from New Jersey, was sitting up front wearing a T-shirt that declared Clinton a liar whose pants were on fire. “I loveDonald Trump. And I’m sorry I’m taking a seat away from an Indian. But it is the third biggest event in my life,” he says. Marriage and a trip to Israel were the first two, he says. After watching Trump on TV and on YouTube, he’s been waiting for a chance to finally see him in person. “There’s no greater joy I’ve ever had than to come and watch this man.” He’s pleased that Indian businessmen, whom he describes as “shrewd,” understand the value of having a strong businessman lead the country. Weightman identifies with Trump, he says, because he is a strong father figure. His own father died in a car accident when he was young. “I had to take charge,” he says. “That’s what I see in this man. I see my father inDonald Trump. I see Archie Bunker,” he says. Bunker, a 1970s American TV fixture who came to be associated with reactionary conservatism, is often described as the “lovable bigot” of that era. 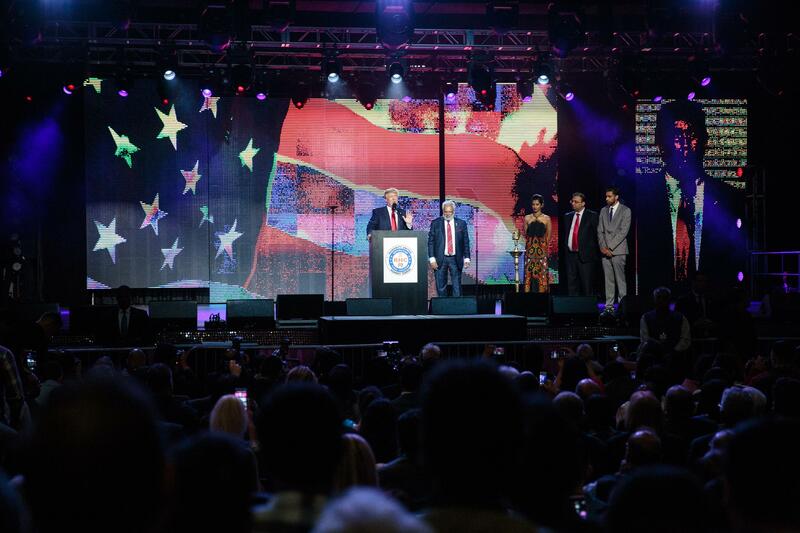 Trump finally strides on stage four hours into the event, grinning and waving to Lee Greenwood’s 1984 classic God Bless the U.S.A.
“Indians see first-hand the brutality of terrorism and cross-border violence, including the attacks in Bombay—and I mean, look, Mumbai is a place that I love,” Trump declares. “It’s a place that I understand. So, for all of the people in Mumbai, the attack on Indian parliament—absolutely outrageous and terrible,” he says, apparently combining the 2008 terror attacks in Mumbai with a 2001 terrorist attack on Parliament that actually took place in New Delhi, India’s capital. The threat of terrorism was the theme of the night. 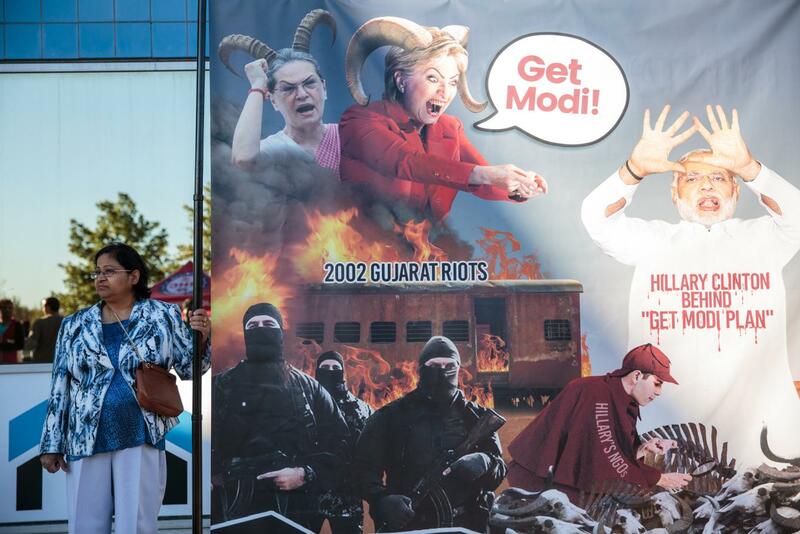 Earlier that evening, Raju Bhatija, a travel business owner from Manhattan, was sprawled across a poster that depicted Hillary Clinton with horns growing out of her head, angrily pointing at the Indian Prime Minister, Narendra Modi, wearing blood-soaked clothes and looking genuinely scared. On a thoroughfare leading up to the convention center, a group of Indian Americans is protesting the anti-terror charity concert. 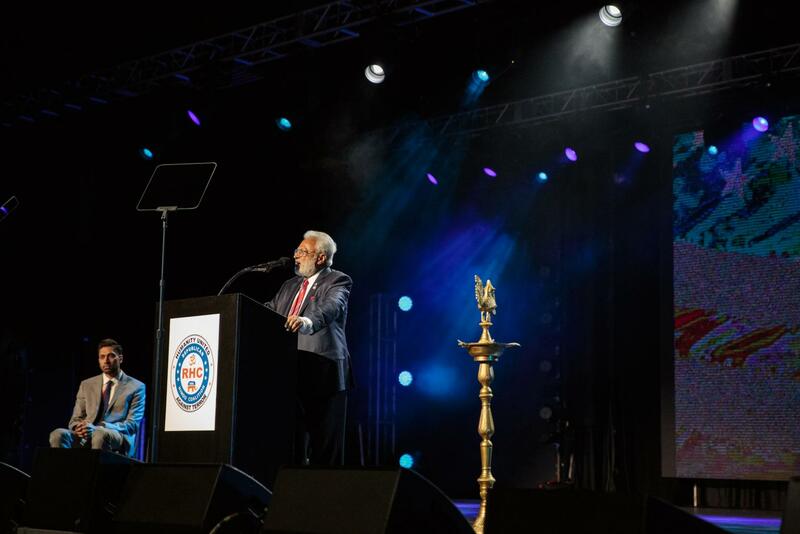 “Those Hindus who support Donald Trump are actually a tiny percentage of all Hindus, but they have a loud and despicable message,” Sunita Viswanath, a board member of Sadhana, a Coalition of Progressive Hindus, says from a podium erected by a sidewalk. 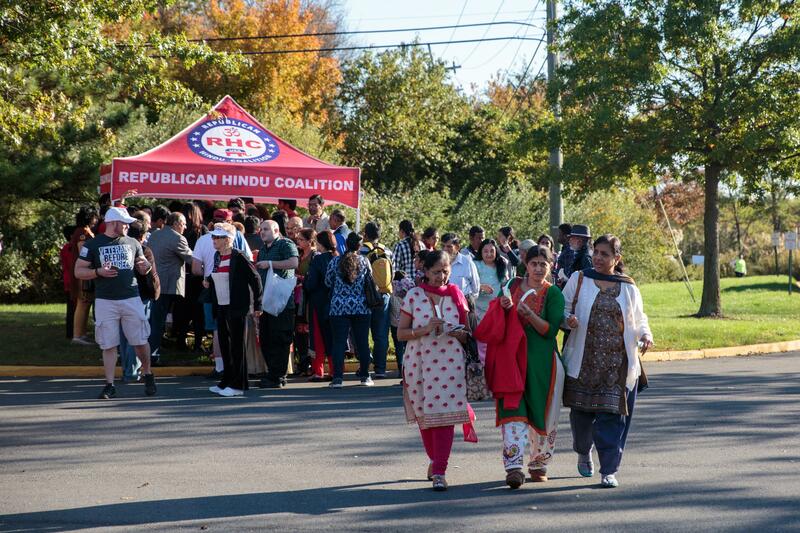 “To the Republican Hindu Coalition we say—not in our name.” There are samosas to go around here, too. The group known as Asian Americans and Pacific Islanders gather to protest the Donald Trump event. Back inside the convention center, a fifteen-year-old and his sister contemplate the evening. Sara Hylton is a Canadian documentary photographer based between Brooklyn, New York and New Delhi, India. This piece was originally published on October 17, 2016, on Roads & Kingdoms/Slate.